Approaches to improve final grain production must consider yield stability, that is ways to prevent yield losses. For example, flowering time affects yield and yield stability– if grains mature late, they may be literally caught out in the cold, as late-season weather turns. Indeed, the application of nitrogen fertilizer, one of the key drivers of increased yields, can delay flowering and maturity of the grain. The application of nitrogen fertilizers can cause environmental pollution and is expensive; therefore, research to improve nitrogen usage has remained a major focus in efforts to improve crop yields and mitigate some of the environmental effects of agriculture. 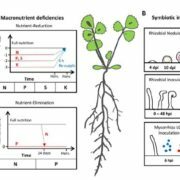 Nitrate transporters (reviewed in Fan et al., 2017) mediate the uptake of nitrate (NO3–) from the soil, and the movement of nitrate around the plant and within cells. 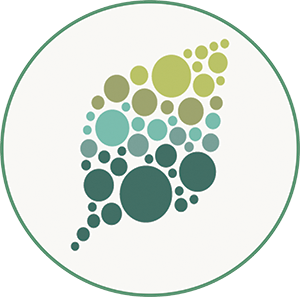 In Arabidopsis thaliana, AtNRT1.1 (also known as AtNPF6.3) transports nitrate and senses nitrate levels, functioning as a transceptor (transporter-receptor) to induce nitrate-dependent gene expression. Rice (Oryza sativa) has three homologs of AtNRT1.1: OsNRT1.1A (OsNPF6.3), OsNRT1.1B, and OsNRT1.1C. Among these, OsNRT1.1A has the highest sequence similarity to AtNRT1.1, but OsNRT1.1B has similar expression (nitrate-inducible), localization (plasma membrane), and functions (nitrate uptake and signaling) (Hu et al., 2015). In further examining these transporters, Wang et al. (2018) found that OsNRT1.1A differs from OsNRT1.1B and AtNRT1.1 in expression (ammonium-inducible) and localization (tonoplast), indicating that OsNRT1.1A has diverged from the other NRTs. 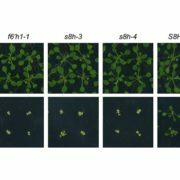 To further examine OsNRT1.1A function, the authors characterized an osnrt1.1a mutant, which showed growth retardation, reduced utilization of both ammonium and nitrate, and decreased expression of genes related to the uptake and utilization of nitrate and ammonium. In the field, the osnrt1.1a mutant plants were shorter, produced less grain, and made smaller grains, leading to an 80% yield decrease compared with wild type; these defects were much more severe than those in the osnrt1.1b mutant. Intriguingly, the osnrt1.1a mutants flowered later than wild type and showed decreased expression of key flowering-promoting genes. 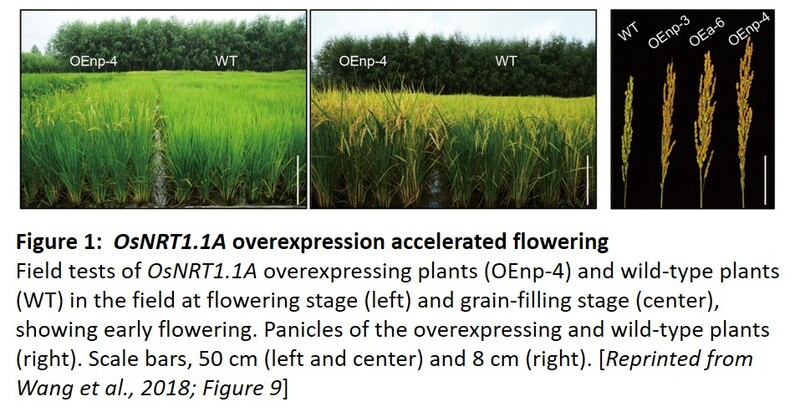 Based on these intriguing mutant phenotypes, the authors produced OsNRT1.1A overexpressing rice plants—and this is where things started to get exciting. 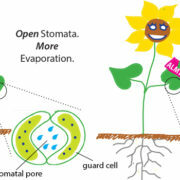 In hydroponic culture, the OsNRT1.1A-OE plants grew taller, greener, and made more biomass than the control plants. They showed improved acquisition of ammonium and nitrate, and upregulation of genes related to nitrogen utilization. 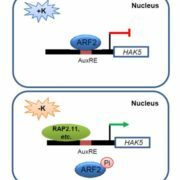 The authors found that OsNRT1.1A might act by promoting the nuclear localization of key nitrate-responsive transcription factors, NLP3 and NLP4, thus regulating gene expression. Large-scale field trials of OsNRT1.1A-OE showed similar results, with yield increases of roughly 25–50% and flowering that initiated about 1–2 weeks earlier than controls, except under short days, when both transgenic and control plants flowered early. 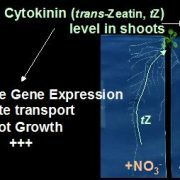 The authors also tested this gene in dicots and found that Arabidopsis overexpressing OsNRT1.1A flowered earlier than controls and produced more seed (by weight) and more biomass. 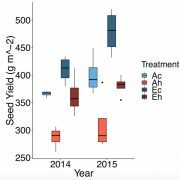 Researchers have tried many angles to increase grain yield; for example, changes in planting density and plant architecture, have proven immensely valuable for improving yields. Given the crucial importance of further increasing grain yield, how can we sort the wheat from the chaff (so to speak) and decide which approaches have true importance for the future of agriculture? The promising but preliminary results described here can’t promise that this transporter will provide the solution to world hunger. Indeed, further testing will show whether this enhancement works in other rice cultivars (particularly indica varieties, as their tests were in the japonica subspecies), other grains, and in dicots. However, the combination of improved N use, accelerated maturity, and improved yield indicate that this one is worth watching in the search for the real yield deal. Fan, X., Naz, M., Fan, X., Xuan, W., Miller, A.J., and Xu, G. (2017) Plant nitrate transporters: from gene function to application. J. Exp. Bot. 68: 2463-2475. doi:10.1093/jxb/erx011. Hu, B., Wang, W., Ou, S., Tang, J., Li, H., Che, R., Zhang, Z., Chai, X., Wang, H., Wang, Y., Liang, C., Liu, L., Piao, Z., Deng, Q., Deng, K., Xu, C., Liang, Y., Zhang, L., Li, L., and Chu, C. (2015) Variation in NRT1.1B contributes to nitrate-use divergence between rice subspecies. Nat. Genet. 47: 834-838. doi: 10.1038/ng.3337. Wang, W., Hu, B., Yuan, D., Liu, Y., Che, R., Hu. Y., Ou, S., Zhang, Z., Wang, H., Li, H., Jiang, Z., Zhang, Z., Gao, X., Qiu, Y., Meng, X. Liu, Y., Bai, Y., Liang, Y., Wang, Y., Zhang, L., Li, L., Sodmergen, Jing, H., Li, J., and Chu, C. (2018). 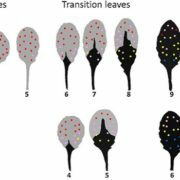 Expression of the nitrate transporter gene OsNRT1.1A/OsNPF6.3 confers high yield and early maturation in rice. 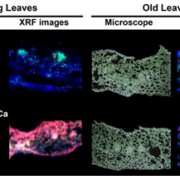 Plant Cell DOI: https://doi.org/10.1105/tpc.17.00809.